The conference venue is in Haidian in western Beijing, close to the area known as "China’s Silicon Valley" (Zhong Guan Cun). The luxury hotel has four Chinese restaurants, a Japanese restaurant, coffee shop, bar and lounge, bank, post office and health and recreation facilities. 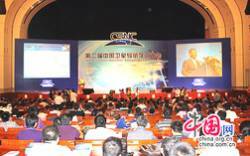 The 13-year-old conference and expo is approved by the Ministry of Industry and Information and organized by the Chinese Institute of Communications. The conference chair is Prof. Yan Qianli, now communications department vice director for the People’s Liberation Army (PLA). He played a key role in the development of China’s military communications system. Qianli is a senior member and former Beijing chair of IEEE.